Members of the FCMH Auxiliary scholarship committee recently presented Ethan Marting with a scholarship. From left to right, Barbara Vance, Marting, Jody Hanawalt and Carolyn Reinwald. Each year the Fayette County Hospital Auxiliary presents a scholarship to two students from Fayette County, donated by the hospital. This year’s second recipient is Ethan Marting, son of Melissa Chapman-Marting. A 2017 graduate of Washington High School, Ethan plans to attend Ohio University this fall in biological science or pre-med with a goal of orthopedic surgery. The scholarship is valued at $2,500. Ethan was very active in marching band, pep band and baseball for all four years. Just before the scholarship presentation, Ethan tried out for the Ohio University Marching 110 Band and made it. Congratulations to Ethan. He also participated in the Kiwanis Teen Talent Show and attends Crossroads Church. The first recipient of the scholarship was Brandon Brown, a graduate of Miami Trace. The FCMH Auxiliary wishes both young men good luck in their medical education future. 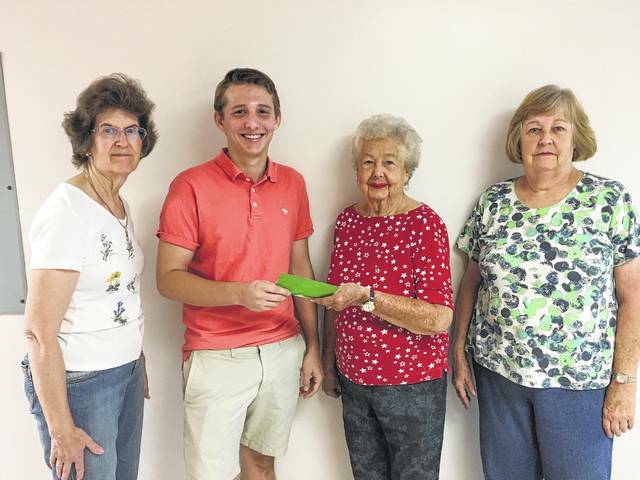 https://www.recordherald.com/wp-content/uploads/sites/27/2017/07/web1_IMG_3594.jpgMembers of the FCMH Auxiliary scholarship committee recently presented Ethan Marting with a scholarship. From left to right, Barbara Vance, Marting, Jody Hanawalt and Carolyn Reinwald.